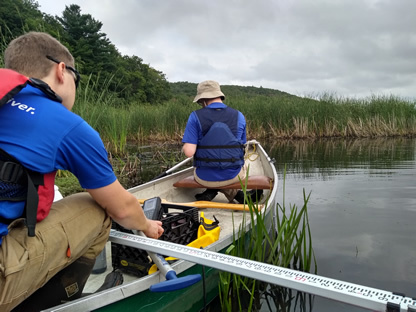 August 21, 2018 - Two staff of the Massachusetts Water Resources Research Center teamed up with a staff from CDM Smith to do some detective work on the Blackstone River in Uxbridge, MA. Since 2004, the UMass Amherst Blackstone River Water Quality Study has monitored this river to develop a watershed management tool for the Blackstone River basin. Funded by the Upper Blackstone Water Pollution Abatement District (UBWPAD) and conducted with the support of the Cambridge, MA office of Camp Dresser and McKee (CDM), now CDM Smith, the study was initiated to enhance the overall understanding of flow and water quality characteristics of the river. The ultimate goal was to develop a tool to evaluate the impacts of waste water treatment plant effluent, the effectiveness of point source control versus non-point source management, and the effectiveness of alternative management strategies on downstream river quality. WRRC continues to monitor the river at nine sites in Massachusetts and Rhode Island between April and November each year. Recently we have observed elevated levels of chlorophyll a at our Rice City Pond site in Uxbridge, MA. This prompted the addition of a mini-study this year to take a closer look at this site to find out the cause for this increase in phytoplankton. Our team of three took to the water in kayak and canoe to sample the river at the usual site and seven other locations. At the most downstream location, boats were not necessary and we sampled from the river bank. The current was strong, as can be seen in this video where WRRC's Travis Drury seems to be struggling with a reluctant sample bottle. Watch the video below to see the outcome!